Do we not perceive what? to become aware of, know, or identify by means of the senses: I perceived an object looming through the mist. 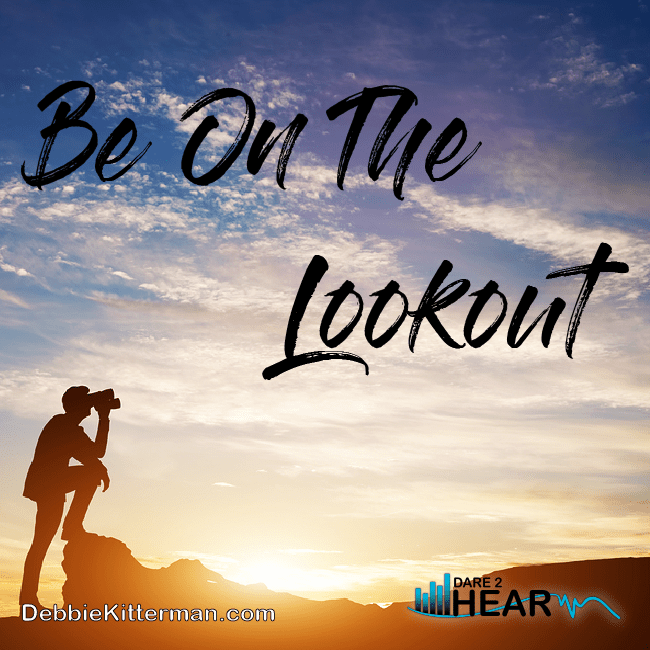 God is saying, that we need to BE ON THE LOOKOUT! We need to recognize, understand, and identify that God wants to do a new thing in our lives. He doesn’t want us to miss it. In this verse God says it will: “Spring UP!” – This indicates speed. The natural result of the spring of the year is that it brings about the rebirth of nature, and new beginnings. The crocus breaks through the ground with purple blooms, the bright yellow daffodils open up in a blast of color after the drabness of winter. The dogwoods and cherry blossoms bloom and the birds begin to sing. Our spiritual life is renewed very much the same way. Be on the lookout for the #NewThing #God is doing. Begin today to be more open and perceptive to God’s work in your life. Be on the lookout for indications of spring. Don’t dwell on the past, or even the current situations you are facing right now. Be on the lookout for what God is doing. 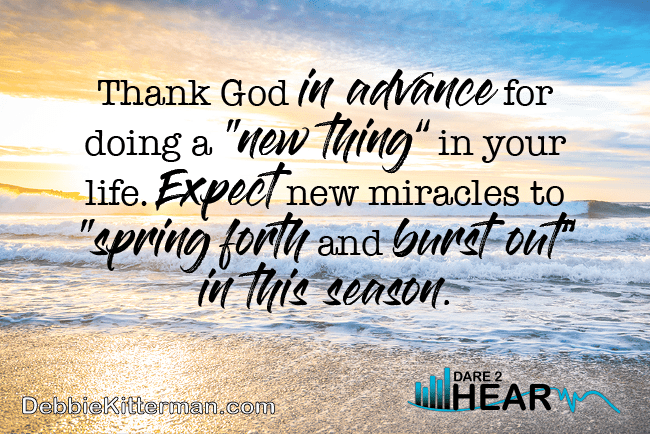 Begin to thank God IN ADVANCE for doing a “new thing” in your life. EXPECT new miracles to “spring forth and burst out” in this season and the coming year. God, I repent for not understanding or seeing what you are doing in my life, even now. I am on the lookout and watching for you to move in my life. I thank You in advance for the amazing new and exciting things You have in store for me in this year. I am ready to walk in Your Newness for my life. I’m ready to walk in the #NewThing God is doing. *Please note, I am at a conference and ‘offline.” I will get to your comments when I return this weekend. Until then, have fun linking up and help share the linkup with others. Next week we celebrate 1-year of linkups here at #TuneInThursday YAY!!!! I am working on a survey to find out what you liked over the last year and what you would like to see this coming year. Feel free to email questions you would like to see me include on the survey next week. It’s Time to Reserve your SPOT NOW for the Build Your Blog BootCamp! While you wait for the doors to open for EBA Check out these wonderful FREE downloads that Ruth has to offer. EBA is a complete program for blogging and yet it is so much more. It was the best money I have spent directly related to blogging. The entire program is full of amazing step by step details to help you not only assess your blog, but its so much more. Click on one of the links below for more details. Have you Heard? Elite Blog Academy (EBA) is about to open their doors for registration. It only happens once per year. The doors open for EBA 3.0 on Monday, March 5th and close Friday, March 9th. Click on the picture below for more information, and to get on the waiting list and to be notified when doors open! You will be glad you did. I stand in agreement with you. I’ve been sensing God preparing to birth something new in me, lately, too. Looking forward to the next NEW thing! Rachel – Love it when we can stand together for each other no matter where we are in the world, by His Spirit we can be united and stand in agreement. Believing for the exciting next new thing for us all. I love these words that remind me to be on the lookout for all that God is doing in me and in others. Great is His faithfulness! Michele – yes, indeed – great is His faithfulness! I too loved that this scripture tells us to actively be looking. Lisa, March has been great so far… and it is hard to believe its here so soon. 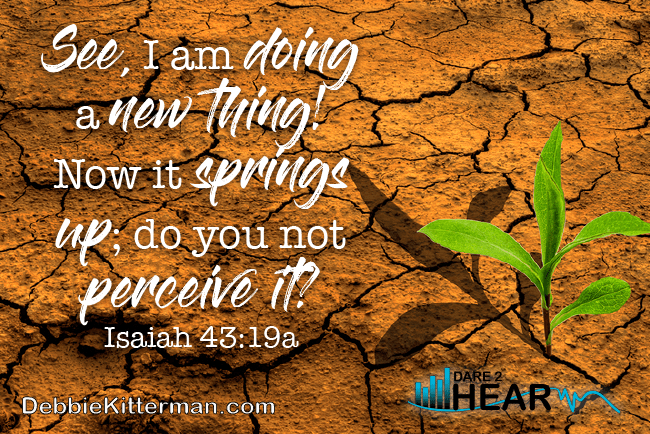 Thanks, debbi – I want to perceive that new thing God has for me to know and serve Him better. Hope your conference was refreshing and enlightening! Thanks for hosting. “I am doing something new, do you not perceive it”. Very powerful message, so often we are looking at the new but perceiving it as something entirely different! Jennifer, I so agree with you — is a powerful message God is conveying to us. and yes, you are so right, we often do look at the new thing and perceive it as something entirely different. I know I have done that many times in the past. Thanks Marilyn, as always, it is a joy to have you here and linking up your delicious food recipes. Thank you, Debbie! Your posts are so encouraging. you are most welcome Elizabeth! It’s easy to just go through the day without being aware of God’s presence and work all around us. Thanks for reminding us to open our eyes and look around. You are most welcome Donna, and yes, it is often too easy to be unaware. Blessings.